Our mission is to develop, design, manufacture and sell to cigarette users smoke delivery devices that cool the inhaled smoke to reduce risks of mouth, throat and lungs burning and scarring, all while delivering a better smoking experience. In August of 2015 our first version of smoke-cooling cigarette holder Smokehealer ‘Cannon One’ has been released. Exclusively licensed by us Patent pending technology (US Patent Application 14/545,579) allows us to cool the inhaled smoke completely natural way. The technology that lies at the base of our method goes back with its roots to 1985 invention of the surface technology in the Kurchatov’s Institute of Atomic Energy in Moscow, Russia. Back than this technology was used in Nuclear Power Station to enhance the nuclear reaction process. Little later it found another implementation in military aviation. The very same scientist that was the soul of that invention has helped us with the development of our product. No doubt that smoking is dangerous for human health. It has been proven time and again. We truly hope that those who read this website will consider quitting smoking! U.S. Department of Health & Human Services has issued multiple warning and reports on the subject of tobacco smoking. We completely agree and urge you to quit smoking! In the United States the government offers assistance to those who are willing to try, and you can access these resources by clicking here. We have extensively tested our product and developed what we see as an optimal configuration and method of reducing the damage that smoking cigarettes does to your mouth, throat and lungs, causing scarring and burning of your soft tissues. Implementation of the votical-boiling technology our device reduces the temperature of the inhaled smoke down to a room temperature as it is passing through the channels in our cigarette holder. To our best knowledge, no other cigarette holder in the world does it as efficient and as effective as our device! 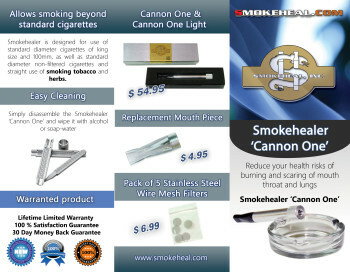 Reducing smoke’s temperature not only benefits your longevity, but also enhances your smoking experience. You can read more about benefits of our device in comparison with other smoke delivery devices, or smoking without use of such devices at all on our Product page.